In case you missed it, two weeks ago I started a new official feature where I post book aesthetics every weekend. They might be of a book I’m currently reading or recently read or read a long time ago or one I consider to be a favorite of mine—there’s no rhyme or reason to it! For now I just want to keep it simple and feature all different kinds of books (but there might be themes in the future). For my third Weekend Aesthetic, I’m featuring Kara Thomas’s Little Monsters. Little Monsters is a dark, psychological thriller. I read this book last summer as part of Kara Thomas’s street team, and absolutely loved the mystery. I cannot wait to read her newest thriller, The Cheerleaders, out at the end of this month! Interested in finding out more about Little Monsters? Read my 5-star review! What do you think of my new weekly feature? 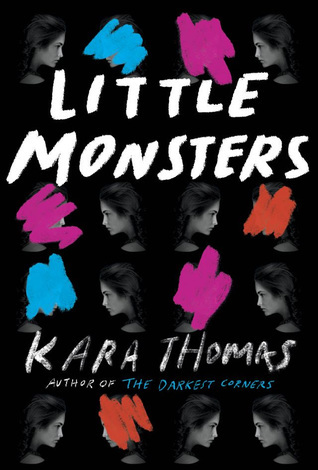 Have you read Little Monsters yet? That’s so neat that you just recently met her—what perfect timing! I hope you enjoy the book as much as I did! I love aesthetics, so I’m definitely into this new feature! I haven’t yet had the chance to read Little Monsters, but I’m definitely looking forward to it, and wow, your aes helped spike my excitement! I’ve heard of this book but it was never high up on my radar until now! I feel like the aesthetic you made has given me a much clearer idea of what the plot is about and now I’m super intrigued!